ACCESSING MAIN PARTS UNDER THE BOTTOM COVER. Remove one screw securing the bottom cover. Remove four screws securing the bottom cover on the back side. Slide the bottom cover to the shown direction. Remove one screw securing the DVD dirve. Slide the DVD drive to the right and remove it. Slide the hard drive assembly to the right to disconnect it from the connector on motherboard. Now you can separate the HDD from the caddy and replace it with a new one if needed. As you see, it’s a regular 2.5″ SATA HDD. Spread latches on both sides of the memory module and after the module pops up at a 30 degree angle, carefully pull it from the slot by the edges. In this particular notebook I found only one memory slot. It looks like some memory was integrated into the motherboard. I’m not sure if all Asus K series notebooks have only one memory slot. Unplug fan cable from the motherboard. In order to remove the keyboard it’s not necessary to go though all previous disassembly steps. There are five small spring loaded latches securing the keyboard. I pointed to them with yellow arrows. In order to unlock the latch, simply press on it with a sharp object. At the same time pull the keyboard upwards. After all latches unlocked, you can lift up the keyboard as it shown on the picture below. Carefully place the keyboard upside down on the palm rest. Before you can remove the cable, you have to unlock the connector. The keyboard cable is jammed between the white connector base and brown locking clip. On the following picture the connector is shown in locked position. Move the locking clip about 2 millimeters to the left (do not move any further). On the following picture the connector is shown in unlocked position. Now you can pull the cable from the connector. Following your description and pictures i opened an Asus k50 ij. Do you have any idea how to reset de bios password? I spotted the battery and i removed it but no success so far, i cannot access the bios . If you have any idea if there is any place to short two pins or something please let me know. This description also applies to Asus X5 series (X5DIJ). Thanks for your very useful stuff. can u guide us to tighten the hinges of the lcd ? My ASUS K50AB have a weird problem.. When I pressed ON button, only fan sound (on). Other part such as LED and Hardisk are not on. What is the problem? How to unplug CMOS battery? Do I need to unplug other parts also?? My ASUS K50AB have a weird problem.. When I pressed ON button, only fan sound (on). Other part such as LED and Hardisk are not on. What is the problem? Could be memory module failure. 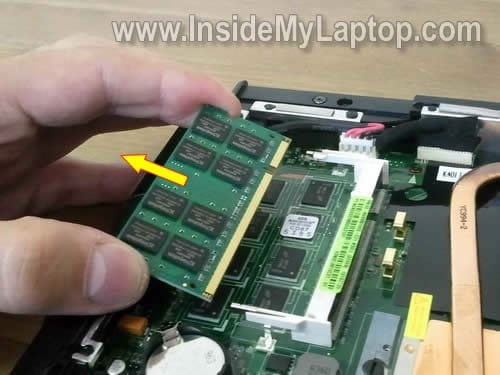 If you have memory module installed into the external slot, try removing it and test the laptop. can you help me out on how to disassemble a k42 model? Some of the pics don’t load. Can you get that fixed? Refresh the page (F5). All pictures are there. I was just wondering whether you could please provide instruction on how to replace the LCD screen on this model laptop. Hi mate….I urgently need to replace the touchpad on this model laptop…I have disassembled up until the end of your tutorial but something is still catching and I am at a bit of a loss and do not want to break anything? ?Yor help would be greatly appreciated!! 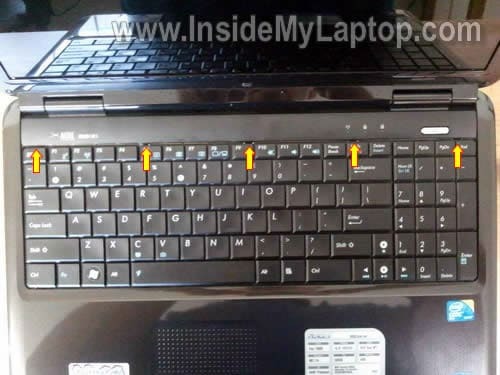 I have a K50IJ and when it attempts to power on, the power button light and the power light on the front of the laptop turn on for about 1.5 seconds. Then it shuts off. This happens on battery or AC. I get no display at all. I remove the hard drive, memory, and disconnected the wireless network card, and it still does the same thing. I also tried removing/replacing the battery, and several combinations of holding the power button. The cooling fan does not turn on, but I’m not sure if it should be on at that point or not. Do you have any suggestions (replace cooling fan, replace MB)? And possibly a suggestion on where to buy parts? I have a K50IJ and when it attempts to power on, the power button light and the power light on the front of the laptop turn on for about 1.5 seconds. Then it shuts off. This happens on battery or AC. I get no display at all. I remove the hard drive, memory, and disconnected the wireless network card, and it still does the same thing. I also tried removing/replacing the battery, and several combinations of holding the power button. The cooling fan does not turn on, but I’m not sure if it should be on at that point or not. Do you have any suggestions (replace cooling fan, replace MB)? I don’t think this problem is related to the cooling fan failure. You should get video on the screen even with bad fan. If you have two memory modules installed, try removing them one by one (not both at the same time). Test your laptop with each module separately, try different slots. This could be memory failure. If it doesn’t help, most likely this is motherboard failure. As a last resort, you can try taking it apart completely and test just barebone system: motherboard, memory, CPU with heatsink. Test it with an external monitor. If it starts in basic configuration, start adding parts. Is it possible to access/replace the graphics module on an X5DIJ? Most likely it’s not possible. Integrated means built into the motherboard. Cannot be removed/replaced. Hello. Is it possibile to install a secondary HDD (a 60GB SSD to be precise) in a K50ID ? Is it possibile to install a secondary HDD (a 60GB SSD to be precise) in a K50ID ? I don’t think so. I believe this laptop has only one hard drive connector. First thx for the very good manual, it´s great. I want to replace the wireless card of my asus K50ID with a “Intel Ultimate N WiFi Link 5300” card, but i don´t know which typ i need to buy, the PCIe* Mini Card or the Half Mini Card. Is this possible and if yes, can you help me choose the right one? could you help me how can I repair the touch pad? How can I remove the all bottom cover? How can I remove the all bottom cover? Remove keyboard as it shown in this guide. 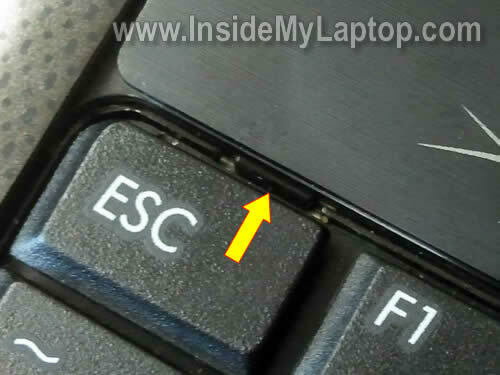 Remove all screws on the bottom of the laptop. Remove all screws under the keyboard (if there are any). Disconnect all cables under the keyboard. Separate top cover from the bottom cover. What is the best way to clear the fan on my laptop with some households material, like vacuum cleaner? And do i must wear an anti-static wrist strap to open my laptop and don’t touch anything inside, just clear the fan with vacuum cleaner? Some people say that vacuum cleaners create static and you can damage the motherboard if you use a vacuum for cleaning the fan. Instead, I would suggest using compressed air for computers. It’s static free and you can buy a can in any local computer store. If you have an easy access to the fan (as shown in this tutorial), simply remove the cover and blow air directly into the fan. Here the bottom cover is divided into parts and is not a single piece like your example. It has all those 5 screws you have mentioned. I remove them and tried to slide the bottom cover but it wont slide. I tried to lift it up a little and slide it, but it seems it is stuck somewhere near the battery compartment, to the very left side of the picture. Are there any more screws or attachments that I need to open, or I just need to use more force. I am suspecting a loose video cable and just want to reattach it firmly. Am I even looking at the right place in the latptop? Are there any more screws or attachments that I need to open, or I just need to use more force. I really cannot tell because your cover is a little bit different. In my case I had to apply some force to slide the cover but not sure if this will apply to your laptop. Just use common sense. Take a closer look at the cover and look for any hidden screws. It shouldn’t be very difficult to remove the bottom cover. and where can i buy internal Bluetooth adapter. Is there any reason you don’t want to go with an external USB Bluetooth adapter. You can find a very small adapter. This worked for removing the DVD drive from a K50IJ, although I had to apply a fair bit of pressure when sliding the DVD drive to the side after removing the holding screw. Thanks so much – I was trawling the net for ages about to give up when I found this page. 1. Is the tutorial applicable to my k40in? 2. should I remove dvd drive –> hard drive –> memory before I can remove the cooling fan? 3. How can I re-attach the thermal paste on the CPU and GPU? Is the tutorial applicable to my k40in? I don’t know. Compare your laptop with one in my tutorial. If it looks similar, most likely you can use the guide. should I remove dvd drive –> hard drive –> memory before I can remove the cooling fan? If your laptop same is mine, you don’t have to remove anything. The cooling fan is located under the bottom cover and can be easily removed. How can I re-attach the thermal paste on the CPU and GPU? Are you taking it apart just to clean the cooling fan? If that’s the case, you don’t have to remove the heat sink. 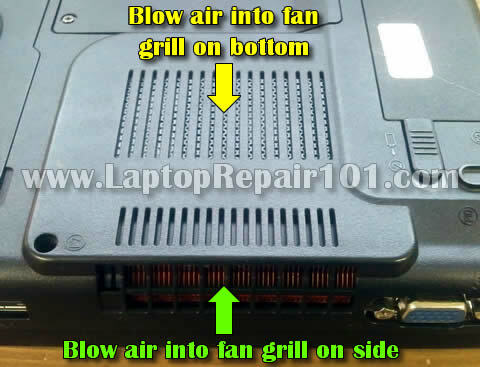 Just remove the fan and blow it off with compressed air. Sir, can you make a tutorial on how to replace the lcd bezel on Asus K series notebook? I’m afraid to disassemble my lcd bezel wthout looking at any instruction. My question is can the K disassembly instructions work on the X52F series? I’m trying to remove the power jack as I’ve traced a charging issue to a loose wire coming from the plug. I’m trying to remove it so I can re-solder the wire to the plug, but I can’t figure out how to get it out. I have taken the back cover off, but it seems as though I need to remove the entire top cover (and probably the keyboard). Any advice? Thanks in advance, and excellent write-up! I’m trying to remove the power jack as I’ve traced a charging issue to a loose wire coming from the plug. I’m trying to remove it so I can re-solder the wire to the plug, but I can’t figure out how to get it out. I have taken the back cover off, but it seems as though I need to remove the entire top cover (and probably the keyboard). Any advice? You are correct. Removing the back cover is not enough. You’ll have to disassemble the whole thing. Remove screws from the bottom, remove keyboard, remove screws located under the keyboard and separate the top cover from the base. Take a look at other guides to get the idea. Most laptops share same disassembly steps. Great tutorial , thank you for sharing it. 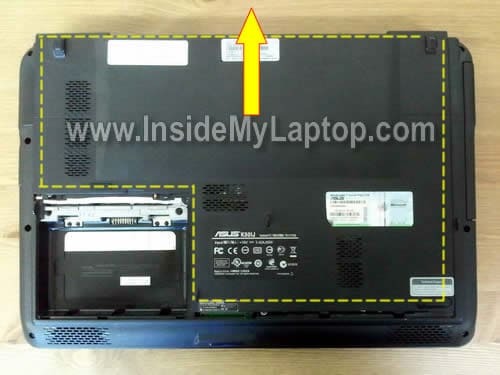 I understand that you don’t know how to remove the back cover but my questions is how to open the front cover (I mean the plastic cover below the keyboard.The one with the touch pad on it and the core 2 duo sticker which can be seen in this picture: “http://www.insidemylaptop.com/images/Asus-K-series/disassemble-laptop-01.jpg ). I removed the seven screws from the back cover (4 on a side and 3 on the other side (the one with the DVD-Rom) but it can’t seem to open something holds it in place. Do I need to open it from beneath and do all the steps you previously showed or is there a way to open it from the front. Thank you in advance. I want to clean cooler of my ASUS. I tried to remove cooling fan but I can’t do it. I remove 3 screws which hold fan, but it’s still firmly held. My ASUS is a little different than your. My cooler remove heat from processor and graphics card. Here is link to pictures of my ASUS so please look, and if you have any idea let me know. Sorry for my bad english. Thanks. to answer your question, you need to remove the half round hinge covers first then remove the screw on each hinge. remove the screen this will reveal 2 more screws under the screen. you should be able to take it from there. Another satisfied customer! Wife would have bought another laptop due to keys that didn’t work. 35 dollars later and it’s good as new. Thanks! 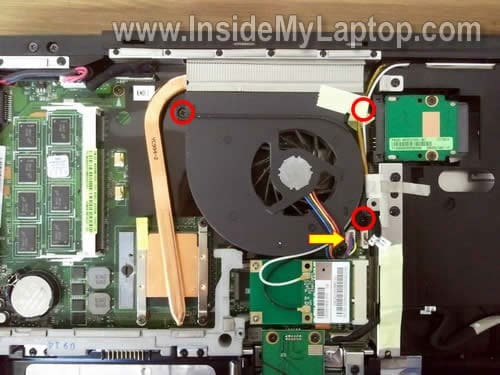 Sir, can you make a tutorial on how to replace the LCD on an Asus K50IJ (same unit you have used in this article). I’m afraid to disassemble it without looking for a proper guide. Thanks in advance…I’ll recommend this site to my friends because I find this site very helpful to those who want to save money from expensive repairs. Unfortunately, I don’t have this laptop anymore so I cannot take pics and make a guide. It’s not the same model but you’ll get the idea how to disassemble the display panel. I found that the disassembly details in your link gave me a hint on how to disassemble the LCD Bezel on ASUS K50IJ. Fortunately, some of the steps are very identical and everything went fine. Hey I am trying to replace my Asus screen and I was wondering what screw driver should I use? In k61 bottom cover has one more screw under hard drive cover. Thanks for the post! Helped me in restarting my CMOS battery. =)) I’m a newbie. I was stuck how to open the thing :)) I didn’t realize I had to slide it hahaha stupid of me. Could you give a picture or a solutions for clear cmos…. Woe this really helped! Thanks! I’m having the same problem with my K61, the solution should be to unscrew a screw under the hdd cover, but how do I take this cover off? I’ve unscrewed the screw under the battery cover but it still won’t give in. can u give me any clue what is really happening. I will be very thank full to you if you will show me some favor. Thank you, the instructions and photos were great, and it worked for me, K50 series. I have a k60ij and its missing the hinge covers I never had any. I’m wondering if any of the k series would fit and where I could find some. I want to sell the laptop but without the covers it just looks bad. Any help is appricatied. Do you have disassemble guide for k43sv? I’m trying to replace the touchpad on mine, but cant get the bottomcover? off. I can get it to come off all the way around, except for the corner near DC charge input. I have a K50I and it is just about the same. My internal webcam is installed upside down. When I Skype I am upside down. How do I pop off the cover on the monitor? I don’t think the webcam installed upside down. Most likely it’s just software settings. Try to find the webcam software installed on your laptop and check the settings. I have a K50ij, can you told me are there an mxm plug on the motherboard? Sorry cannot help. I don’t know. Great guide, I am looking to get in deeper and re-solder the DC jack. Does that require the removal of the mother board? If not, how can I get to it? Hello, I wondered how I could disassemble this laptop. Super guide. I am looking to get in deeper and re-solder the DC jack. Does that require the removal of the mother board? If not, how can I get to it? Yes, you’ll have to disassemble the laptop completely. But it’s possible the DC jack is not soldered to the motherboard. I don’t remember that off the top of my head. It’s likely the jack is attached to the power cable which can be unplugged and replaced with a new one. Search for a new DC jack on eBay using your laptop model number. You’ll see if this jack is available with the harness. Thank you!! got everything out but the keyboard. This definitely helped. I have a dead K40IN, The layout is almost exactly the same – it has 2 spring clips holding in 2 removable ddr2 ram modules. This here site is such a great help! Even ASUS Netherlands could not tell me how to go about adding more memory to my K70A. How do you remove the palm rest on K50IJ.. 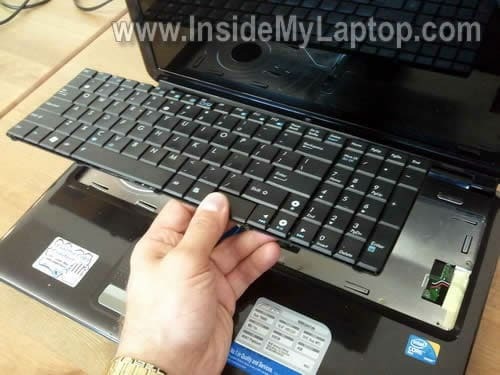 I think you disassemble the laptop as it shown in this guide. After that you remove all screws from the bottom of the laptop. If there are screws under the keyboard remove them too. Also disconnect all cables found under the keyboard. Finally, separate the palmrest assembly from the laptop base. Asus K50IJ exactly the same. changed keyboard due to broken P/0/-/= f11 12 pause break home numlk and ? the new keyboard is slightly different but everything works as it should b. What do I need to do to replace the LCD screen? I have many LCD screen replacement guides on this site. They are for different laptop models but they are very similar. Read though a few guides and you’ll get the idea. So, which one is the GPU? 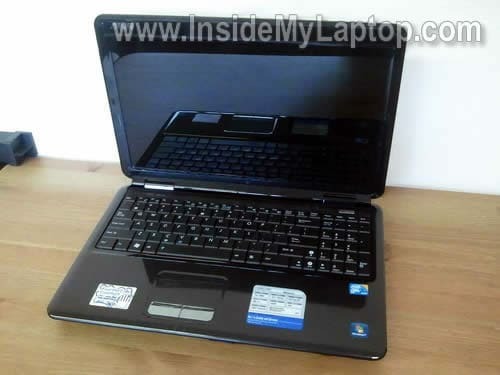 I have a ASUS K501 which is almost identical to this. I am hoping the GPU is in the same location. If anyone could tell me it would be amazingly helpful. I actually just got off the phone with ASUS tech support. After bouncing me around 4 times, no one could tell me where the GPU in my laptop was. Most likely it’s soldered directly to the motherboard. In order to access it you’ll have to remove the motherboard from the case. Which one is the motherboard? Is it the whole thing underneath the memory and CMOS battery? This is correct. The motherboard is the main circuit board in the laptop. Ok, gotcha. That seems like a big project but I think I can handle. Just one last question then I’ll leave you in peace. How will I know my GPU when I see it? What does it look like? By the way, this is the only place in all the internet I’ve found that helped me. I am eternally grateful. works perfectly with an K70IC, with the additional screw under the HDD cover to hold the back cover (so you need to remove the battery, remove one screw holding the HDD cover, remove the HDD cover, then remove the final screw holding the back cover). What Cyrille said also goes for K60IC. I have Asus PRO66IC (according to the label) but according to windows it’s a “K61/71”-model, it looks very similair to the one in your pics so I assume it’s a K-series laptop. Either way, there seems to be some bad connections between the screen and the mobo/nvidia chip, I get a lot of white screen flickering, especially when the screen is showing a lot of black, however, I can make the flickering go away by pressing firmly from underneath, in the mid section about the location of where the U-I-O and 7-8-9 keys are located, and the screen works just fine. I was trying to get an idea of what might cause this by looking at your pics, but I’m a little confused as there’s no apparent culprit. Any suggestions before I open up and have a look? I decided to have a look at it anyway. There was a cable running over the processor fan outlet that then connected to the motherboard, the cable was well insulated and thus fairly stiff, it was also a bit too long so it ran across to the plastic GPU connector before doing a 180 degree turn down to its connector situated between the processor fan and the GPU connection, this seems to have slightly pulled it out of its socket, and simply pushing it back in again and move the cable solved my problem. I figured I should post my findings here incase anyone else comes across a similair problem in the future. 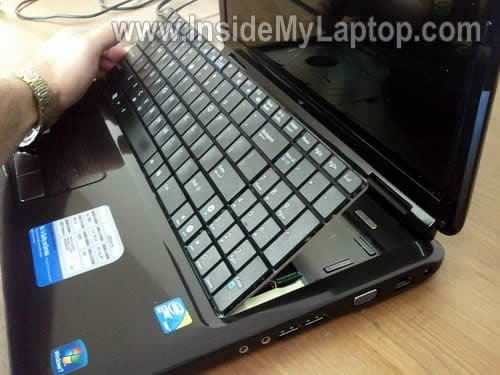 Maybe you forgot to turn off the laptop before stating taking it apart? Was it in sleep mode? Finish the repair. Hopefully it will start properly after that. Is it possible to unmount the touchpad? Super good instructions on how to take this laptop apart, etc. My friend has Assus K50i which apparently had been bumped at the ac connector and would not power on. The inside female a/c connector was loose so I took it all part to see what was wrong. The power cord connector seems to make good contact showing 15v at the motherboard end. At one point the laptop did start up and stopped at the BIOS screen. I put it mostly all back together and exited the BIOS but it did not power on and is dead again. I checked all connectors and the power button seems to work OK. The BIOS battery read 2.3v so I changed it out but still nothing. I’m stumped – any suggestions now? I have the same problems Matt and Cyrille has (85 and 86), i unscrew the 3 screws of the fan but it doesn’t move. I tried in all directions, even up/out. I’m afraid about making too much force and break something. Model K5oin. Have you any clue about which moves to do? Add to post #94 – I ordered and installed a new dc power jack with wiring harness which plugs into the motherboard. Can’t believe it was only $3.39 incl shipping..haa. Tested for 15.v dc power OK up to motherboard. Put laptop back together, checking every part and connection, etc. since at one point it did power on which seems to suggest a loose connection? Still will not power on. Power button seems to work fine but nothing I do gets power on. I’m stumped. Any suggestions? Is there a fuse somewhere I can’t see? Next step? 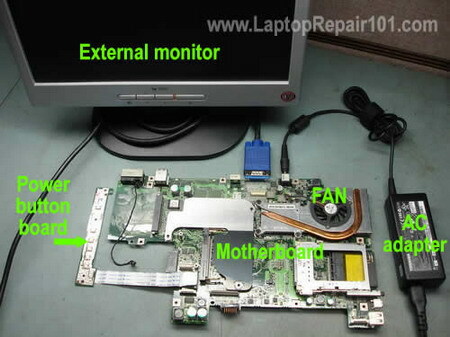 – take laptop completely apart and motherboard out and test it ? Recall seeing a post on here with picture showing the mb all laid out, etc. ugghhhhh. Thanks. Anyhow know how we contact the original author of this post? Thanks or the excellent guide. As I posted on #94/96 I would like to contact the author of this article to possibly get additional help. Does anyone know how to do that? I am sure they are busy but does the author ever check this thread? I am willing to ‘donate’ if I get specific help. Thanks. Tested for 15.v dc power OK up to motherboard. Put laptop back together, checking every part and connection, etc. since at one point it did power on which seems to suggest a loose connection? Still will not power on. Power button seems to work fine but nothing I do gets power on. I’m stumped. Any suggestions? I would probably test the motherboard outside the laptop case. Maybe the motherboard not installed correctly and it’s shoring somewhere. Certain keys on my ASUS K50 ceased working. I took it off thanks to this guide, detached it and reattached it without too much hassle. I bought a new keyboard and it arrived yesterday. I took the old keyboard off and attempted to attach the new one, but the cable won’t stay attached. Now even trying to attach the old one it remains loose. Have I done something wrong to the clip or am I just doing bring stupid in my painful attempts? Addendum: The keyboard that arrived had some odd button under the space bar that doesn’t seem to fit despite being advertised as a keyboard for the K50. i have a problem, my notebook got a splash a water when im working, and the type is K 43U, and i want to try dissassemble it to dry it, can u give the instruction to dissassemble? my notebook got a splash a water when im working, and the type is K 43U, and i want to try dissassemble it to dry it, can u give the instruction to dissassemble? Take a look at this guide for Asus K53U. Asus K53U could be similar to Asus K43U. hi! thanks for this guide, I found this quite handy! recently I’ve thought about replacing the motherboard. I currently have the k40IJ and I’m wondering if I could fit in a motherboard meant for the k40IN. I believe it is theoretically possible since they have the same body, right? And, do they have the same motherboard for the k50 counterparts? (eg K50IN and K40IN). I’d think that we can’t fit boards from successor k4X series right? Is there a fuse on the motherboard for this laptop? I can’t switch mine on and the power supply is ok.
Cured, not exactly sure what the problem was, I pulled the power supply connection plug off, checked the connections, plugged it back in and it powered up. Could it have been a self resetting fuse that required the battery to be removed (powered down) to reset?? Thanks for the confidence to start pulling the machine apart! Sometimes removing and reinstalling the battery can fix the problem. How? I don’t know but it works. Where’s the rest of the instructions? I need to get the top and bottom case separated so I can access the lcd to motherboard cables. I don’t have complete laptop disassembly instructions for this model. 1. 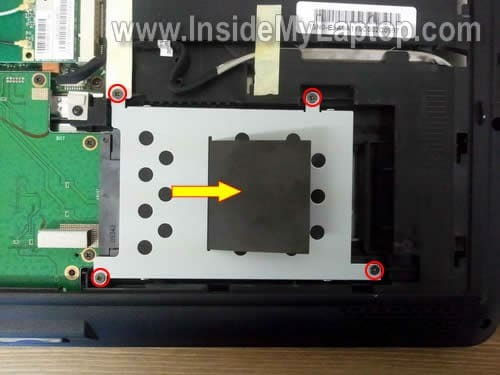 Remove all remaining screws on the bottom of the laptop. 2. 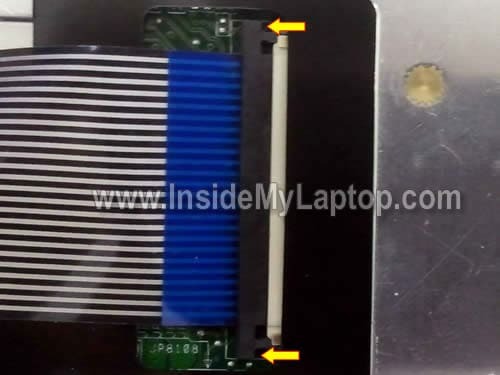 Disconnect cables on the bottom of the laptop. 3. Remove screws located under the keyboard. 4. Disconnect all cables located under the keyboard. 5. Separate the top cover assembly from the bottom cover. 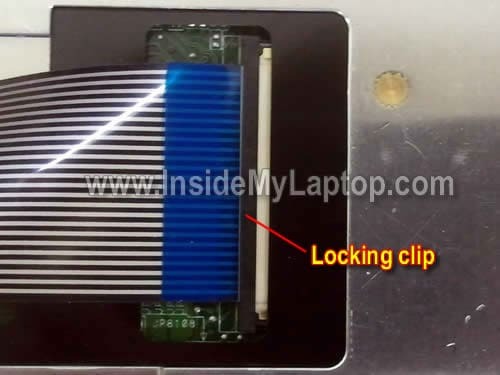 Can you post pics to disassemble ASUS X42JY laptop ? When I get this laptop for repair, I’ll take pics and make a guide. once the keyboard get wet is there a posibility that it wont work anymore or not functioning?it would need to be replace? If you spilled something on the keyboard there is a good chance the keyboard will stop working properly. If that’s the case you cannot fix the keyboard. You’ll have to replace it with a new one. Worked a treat on Asus K series. Thank you! I have a Asus k53u. How i can i get this out in the simplest way? Thanks for this tutorial. Where can I find the gpu? I have the same laptop, and it tends to overheat a lot, so I’m going to disassemble it, but I can’t find any service manual on the internet. The Fan isn’t that simple to disassemble. It isn’t hold just by those 3 screw. To elaborate on this, in some models (like mine apparently!) the copper bar that runs from the processor heat sink to the fan is hard fixed to the fan. In order to remove the fan, you need to remove the heat sink and bar screws (4 on the CPU attachment, one on a sort of metal “bridge” at the “elbow” of the bar), and also may have some glue or something under the bar. Anyone have a guide how how to replace the DC jack? hi , i have problem with power button , how to fix it ? Hello. I have a K50IJ and my drive is dead. What do I have to look for when buying a new one (what specifications) besides what size (500GB) I want? Thanks so much for you help! I checked power at power supply and at motherboard both were fine you showed everything but the fuse on the asus k501j please let me know.a picture would be great then i know i will be checking the wright thing.also let me know my options if it turns out to be the motherboard.thankyou very much. i have asus k601. the power jack needs replacing. i have the bottom off but cant get the top off to access the power jack. do i need to remove the keyboard to get to screws holding the top? Every website I’ve looked at from Crucial and others for memory upgrades say that this computer has 2 memory slots. Yet, the slot on the board when you remove the bottom cover only holds one memory chip. This slot is already filled with a 2GB chip. Here’s where it gets weird. This computer is allegedly upgradeable to 4 GB of DDR2 memory, and you are supposed to install it in a pair of 2GB chips. Now, it would make sense if part of the memory is on the board, and you add the second chip to make 4GB, but when you open the System Preferences, the computer says that only 2GB is installed. So what gives? I have an asus X5DIJ (about 10 years old). Until two weeks ago it was working find. Then the wifi stopped working. I reinstalled the driver and deactivated it and activated it. Nothing worked. The wifi light went on and off as it normally would but no connection. Also deactivated and reactivated the card and reinstalled the driver. Internet via the Ethernet cable works fine. hi, I have a k450j ….is it possible to upgrade ram and graphics card? How do you remove the screen to access display cables? Hi Can you upgrade the video graphics card for the K40IN? And also If you can replace the wifi chip and antenna? I have a k53e-××× While I have taken off the front underside panel to access HDD, RAM and the CMOS Battery. I can’t see a simple way to remove the DVD drive, I am going to replace it with a new SSD. 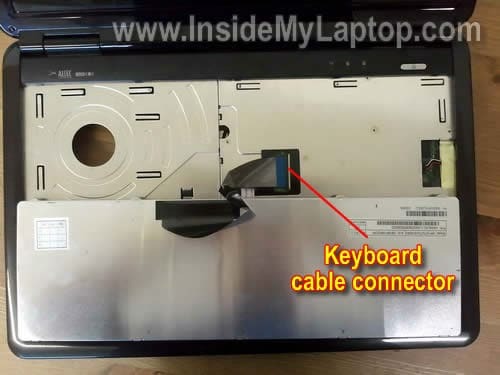 In your laptop the DVD drive is secured by one screw which is located under the keyboard. After you remove that screw you’ll be able to pull the DVD drive out. 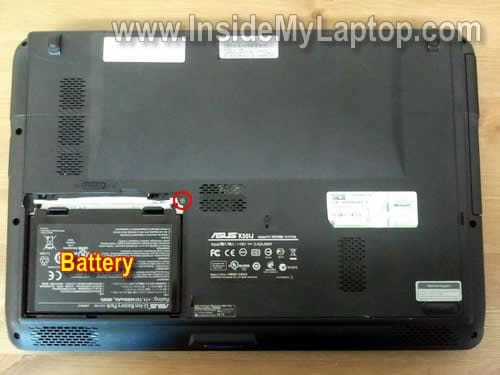 Take a look at this guide for Asus N53S laptop as an example. The DVD drive removal shown in the step 19. 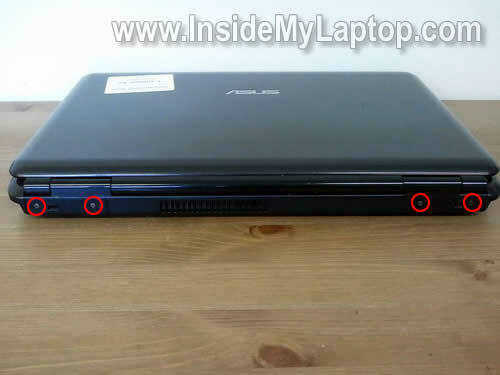 Sir I have a k40ij laptop just like on the picture and my problem is it is not booting..When switching power on button the asus logo appears and maybe 5 to 7 seconds it turns off then asus logo appears again just like when it turns on then turns off again and again..i can still open the bios setup by pressing F2, set to manufacturers default but still not working..I think maybe problem with the hard drive, but before i dismantle it i just want to ask an opinion from you,maybe there is other way to fix this..your help will be much appreciated. Where would you find the bluetooth adapter, if you have one, inside of a k53e bd4td? I have K60U with bad power port. How do I replace??? Thank you so much! Worked for my X5DIJ and now I can use ‘r’ again!